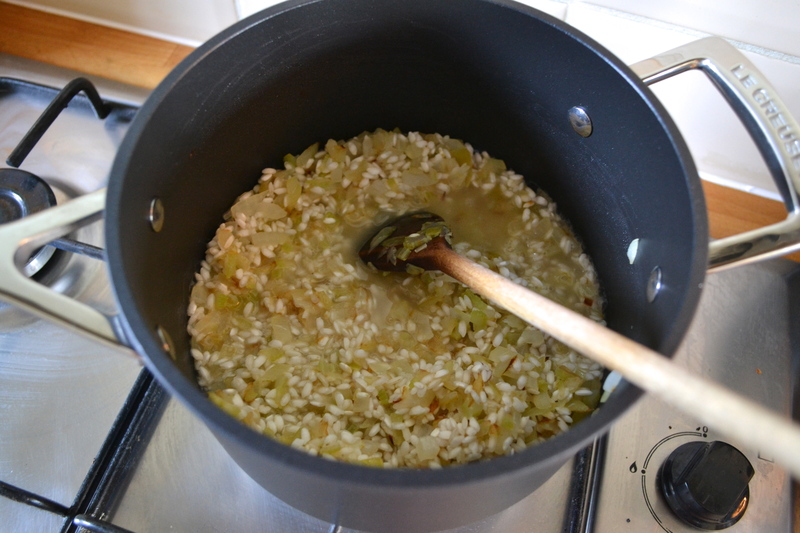 I first learned how to make a risotto after being given Jamie Oliver’s Return of the Naked Chef back in 1999. I love the way you can transform something as dull as rice into something delicious with the help of just a few ingredients and a bit of stirring. 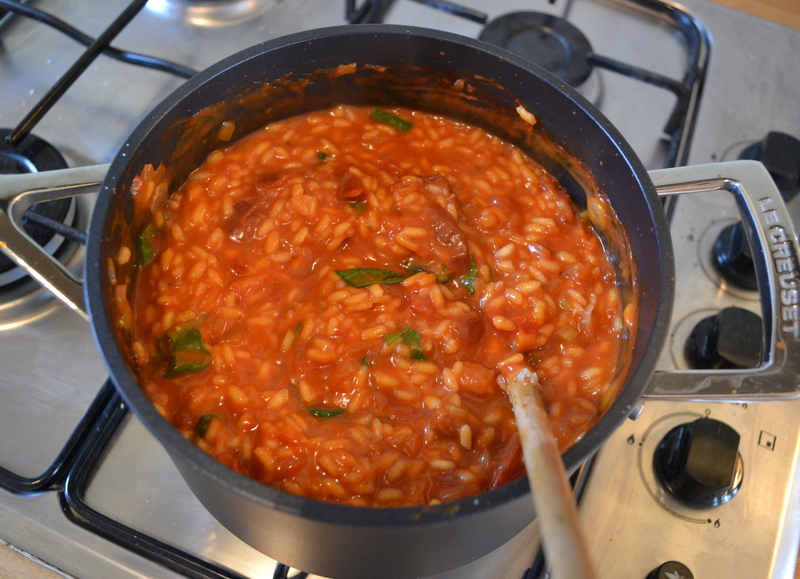 The great thing is that once you know the fundamentals of how to make risotto, the varieties you can create are endless. Mushroom risotto is a classic, but then there is butternut and goats cheese; prawn and pea; chorizo; lemon and asparagus – the list goes on and on. 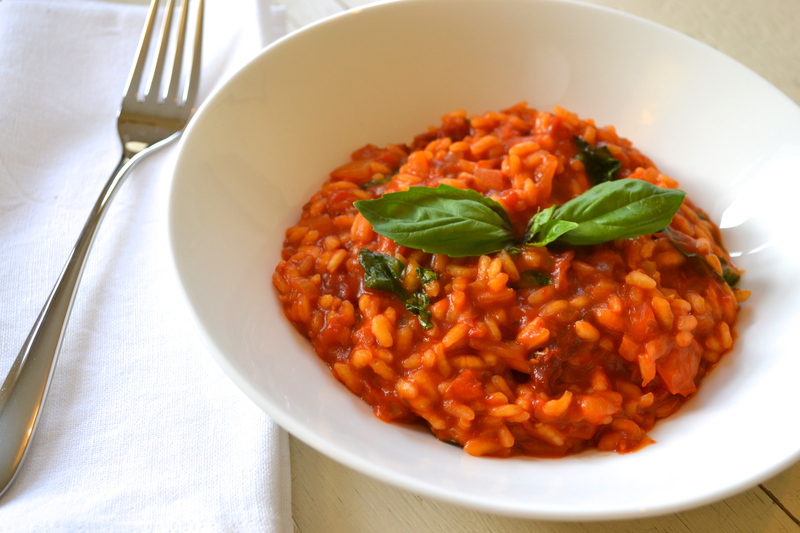 Tomato risotto may not as glamorous as something like prawn and pea risotto, but it’s a great store cupboard staple and real comfort food that makes the perfect mid-week supper. It’s incredibly easy to whizz-up provided you stick to two rules: i) don’t get distracted and forget to stir and ii) don’t get impatient and add all the stock in one go. If you can keep stirring and only add a little stock at time, waiting for rice to absorb all the liquid before adding more, you’ll end up with delectable creamy risotto every time. Today’s recipe originates from my time at university. It was so delicious that sometimes I used to eat it several times a week. 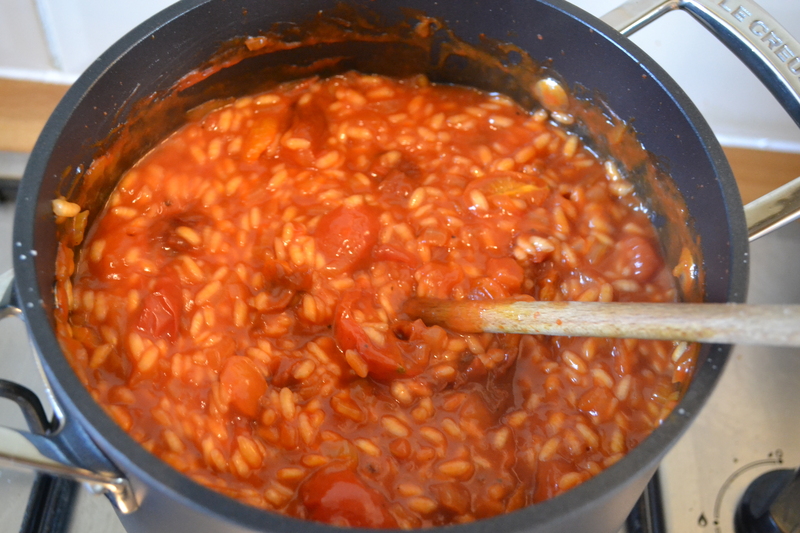 Given that I was a student, the ingredients were pretty basic: tinned tomatoes, risotto rice, garlic and stock with a bit of grated cheddar. I’ve since refined it a little, replacing the cheddar with parmesan and adding sundried tomatoes, roasted cherry tomatoes, and basil. But if you’re after a quick store-cupboard supper fix the result will be just as good without the basil and cherry tomatoes. Pre-heat the oven to 170°c/150°c fan. Arrange the cherry tomatoes cut side up in a roasting tin along with the garlic cloves (leave them in their skins), drizzle with a little olive oil, and season with a good grind of salt and pepper. Roast in the oven for 1 hour. Heat a good glug of olive oil in a heavy based medium pan and gently cook the onion and celery for about 20 minutes until softened. Don’t let the onion brown as this will affect the flavour of the finished dish. Add the risotto rice, to coat well and heat for a minute. Pour in the wine and stir until absorbed. Next squeeze the garlic cloves to release their flesh from inside, add to the pan along with the chopped tomatoes. Keep stirring until the majority of the tomato juice is absorbed. Add the passata and stir until absorbed. Now add a ladleful of stock at a time to the pan, stirring all the time, allowing the rice to absorb most of the liquid before adding more. The whole process should take about 20 minutes from adding the rice. 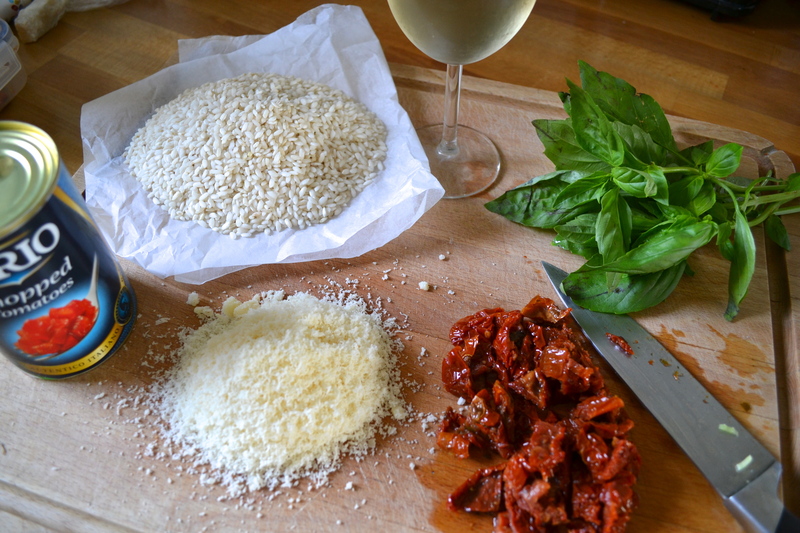 After about 15 minutes add the sundried tomatoes and roasted tomatoes and after the 20 minutes are up, add the parmesan. 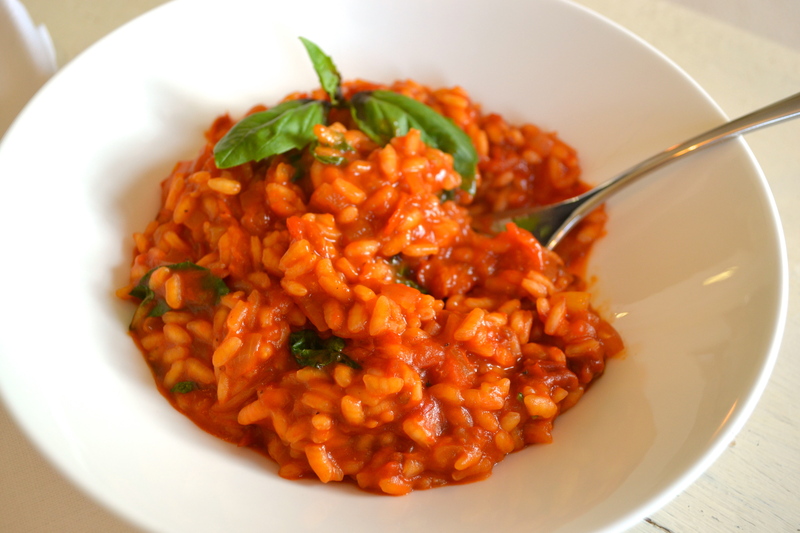 The rice should be cooked through with a little bite left (al dente). Put aside to rest for 5 minutes. Add the basil and stir well before serving immediately.